dance.net - First ever dance costume/dress (10099511) - Read article: Ballet, Jazz, Modern, Hip Hop, Tap, Irish, Disco, Twirling, Cheer: Photos, Chat, Games, Jobs, Events! 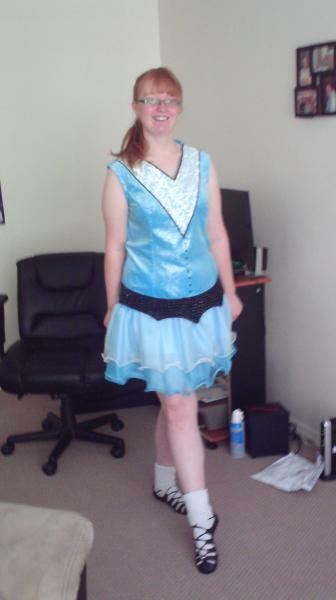 This is my first ever dancing costume. It's just our school performance dress, but it's the first time I have ever got to wear a dance related costume before, so I wanted to share it. Due to my age I wear black tights when I perform, but my dress came before I got my tights. Pretty! The color looks awesome on you. Hope you enjoy dancing in it, as much as you enjoy wearing it. You look lovely! I really like it! Hope you enjoy dancing in it! You look lovely! Have fun dancing in your new dress.